The day we met Cinderella… ah yes, it was bittersweet. 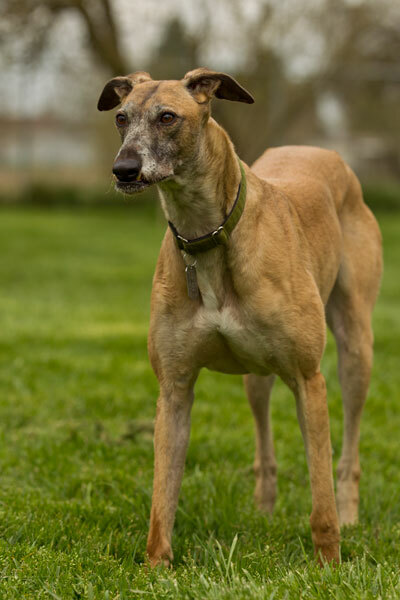 We knew another hound would someday becoming to the gardens, but we said good-bye to very dear friends as they moved to the other side of the United States. During the Flocko and Minnie days, we became great friends with a kennel owner. Karen and I spent many a week-end at their greyhound farm. Buddy and Skirvee were born on that farm and they frequently went up for visits as well. My favorite calls were the ones announcing a new litter of puppies. When racing ended in Oregon, our friends moved to Florida. Cinderella was one of the last litters to go off to training. Puppies spend their first 12 months with their littermates. They learn to trust each other and bond with the humans that care for them. It was time to round up the puppies and Cinderella wanted nothing, absolutely nothing to do with that. She was perfectly content playing with her littermates, hiding in the briars. I followed her on my hands and knees through a briar tunnel to catch her. Karen was standing on the outside looking in, took one look at her and said she was coming back to Oregon when she retired from racing. Of course, Cinderella wanted nothing to do with racing either. She’s a party girl. Karen flew down to Florida in December to fly her back to Oregon. We were having a beastly cold stretch. Dogs can fly when it is above 20° and below 80°. I woke up that morning and it was 18°. The weather was predicted to be 21° at the time their plane landed and they let her on the plane. She’s been our Nelli Bellie ever since.